This weekend was the 3rd Formula BMW race weekend. Once again, I watched it live from home. It is something different to watch the races you are actually supposed to be racing. I am learning to deal with the fact that my racing career has taken a one-year-brake. I am neither racing karts nor cars. Of course I have done some testing, also drove some kart races. Not to forget The Mallorca Cup, where I finished 5th under the Rookies. But I was meant to drive Formula BMW Germany in 2007. Which did not happen because of a Sponsor dropping out. At first I had a big problem dealing with not sitting in an FB02 cockpit for 2007. Now I see it as a challenge. I have time until 2008 to find a decend Sponsor, who will support me for a longer time in my racing career. I have enough time to get my body with fitness training into great quality. I am testing different cars on different race tracks, that is always a plus. And one more positive thing: I get to see how my "next-year-competitors" are acting on and off the track. My second time turning a "couple of laps" at Oschersleben. This time I'm leaving the racetrack with a bigger smile! I had to show RTL (big european TV Channel) what I got. I drove the FR1600 from the Motopark Academy. The day started out already in stress. We couldn't find a seat for "small-Jackie"!! Right before we were about to give up and call it a day, we found a descend seat. Then I got the car the first time explained to me and ready to go! The TV crew came to the racetrack at 8am; we had a timeframe until 12pm, since the video was going to be broadcastet on TV the same day at 6pm. RTL mounted 2 cameras on my car. One had a cockpit view, the other was down by the right front tire. They followed me with a Safety Car around the 3,667km long track in a Volkswagen GTI and filmed me from the front and the rear. Top finish of the day, the reporter Kim Höhne got to drive in a Ford Fiesta ST Cup with Instructor and ex driver Patrick Bernhardt from the Motopark Academy. Her face expression is priceless. To see it for yourself click on my link. To sit in a formula car again, since a month break, was an amazing feeling to have back! Now I am really excited for the 5-day test in Southern Korea with the 2.0 Liter Renault from Team E-Rain. 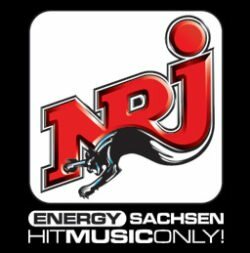 The german radio broadcaster RADIO ENERGY made an interview with Jackie about the topic "females in motorsport". You can listen to the audio stream (.mp3). The interview was taken in her mother language german. 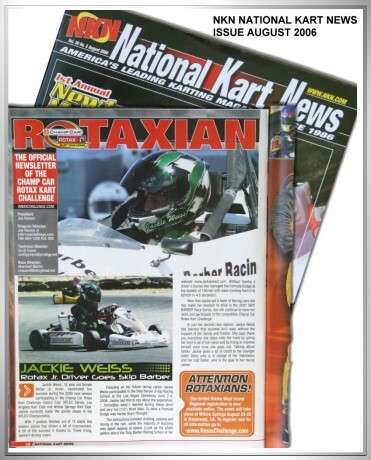 The largest print magazine in the karting business, the NKN National Kart News covered the Progression of Jackie Weiss in their August Issue on one entire page. I made the 2day racing school which bridges the gap from the 3day racing school to the race weekends. I qualified to practice and race with the winged R/T 2000 (sequential 5-speed gearbox and BF Goodrich tires). Incredible what I learned during these short and very hot 3 days! To drive a Formula Dodge was harder than I thought. Many new friends and a lot of new knowledge was the result of this weekend. This race didn't have that many Rotax Junior Drivers. The heavy winds from yesterday with the Gatorz Cup on the track died down, so our times have been better: I got into the 44seconds and finished 2nd. An exciting race with 15 Rotax Junior Drivers on the grid! We were all very close in times; me and Michael Leib had a great battle. ...Mrs Hawaii Tropic International raced in the TAG class! It was a cool b-a-c-k-w-a-r-d-s Race at the XPlex - we had a lot of fun! I made in quali, pre-finals and finals 2nd and this time my sis Daisy was very close to me, getting 3rd in all races. I snatched the lead in the Main Race after 4 laps - crucially ahead of Carmyn Schottmuller and Casey Neuman - and led the whole race with a comfortable 20-second cushion until the flag. I lost 1:40min with this incident, but I finished the race with an exciting 5th place! We met a lot of nice people in Californa and I'm looking already forward to Grange on the next weekend! 4 Races in this season so far at the XPlex, and the second red flagged race! I had a great start in my heat race, went from 3rd to 1st by the first turn. Too bad it only lasted a couple of laps: I got passed by Austin Isaac for 1st. When I went on to get my position back, I nailed a dirt pile and flew out of my kart. 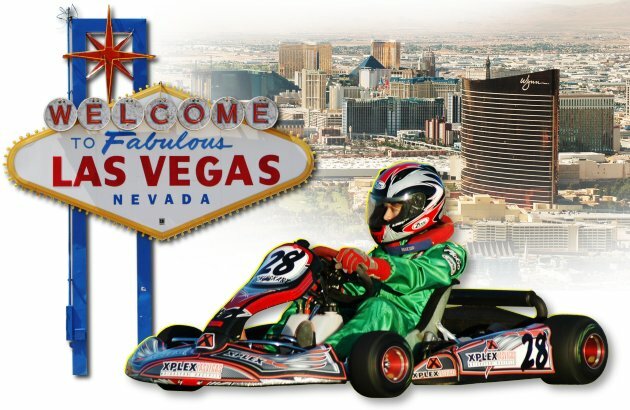 5 sprint races with Johan Schwartz at XPlex Racetrack, Las Vegas. I tooked the checkered flag after 347 laps for our Team. I finished 1st in Qualifying; 1st in Heat Race and 2nd in Main Race. Our Team "The Banana" finished 2nd with a gap of 0,0022 sec! 3rd place points winner 2005 Rotax Junior Class, Southern Nevada. Las Vegas Speedway: We finished 3rd in the coldest race of 2005! My first night race - and my first podium finish! Find the Rules & Regulations, Entry Fees, Race Classes, Track Map, Schedule etc. here! who is my first sponsor and helped me with all of my racing clothes. And by the way: it's fabulous to wear!! Of course also many thanks to my parents and especially my sisters who sometimes have a 'hard time' with me and my schedules!